This statistic shows the number of preschool class teachers in Sweden from academic year 2007/08 to 2017/18. 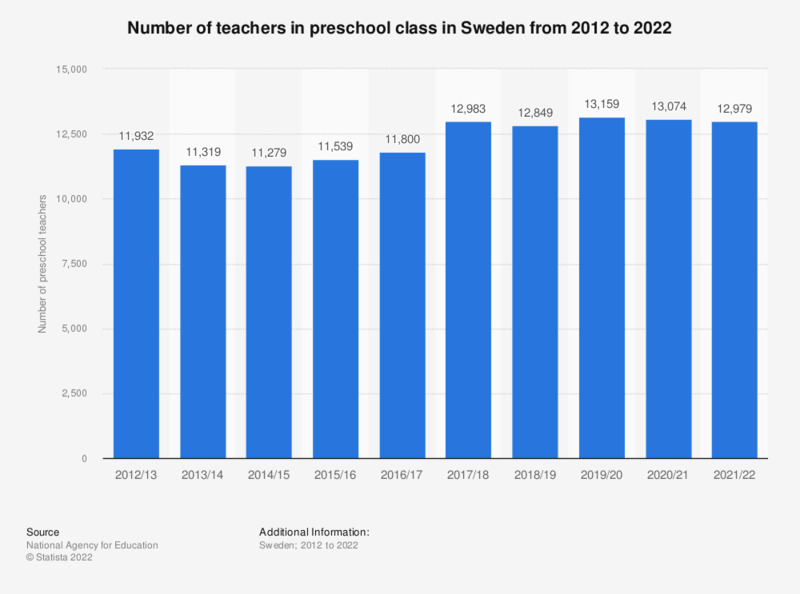 In 2017, there were 12,983 preschool class teachers in Sweden. The statistic is classified in academic years. Numbers include only teachers who were working at the particular period and does not include temporary (< 1 month) hires. During the year before children start compulsory school they are offered a voluntary 1 year preschool class. It combines the pedagogical methods of the preschool with those of compulsory school. Usually children start a preschool class at the age of 6. For which of the following reasons, if any, are you thinking of leaving the profession in the next 2 years? Has your morale improved, declined or stayed the same since May 2010? How much do you trust school teachers to tell the truth?